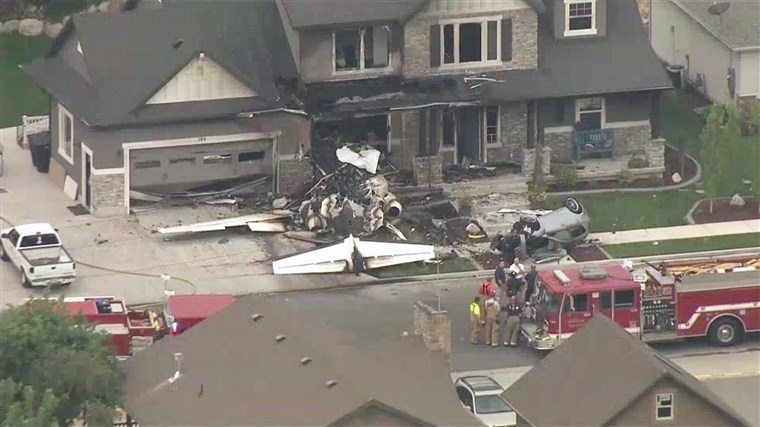 AKIPRESS.COM - Just hours after being arrested and released on bail for allegedly assaulting his wife, a Utah man stole a plane and crashed it into his own home where his wife was staying, police said. The man, 47-year-old Duane Youd, did not survive the crash Monday, officials stated. Flames engulfed the house in the city of Payson after the crash and ensuing fire at 2:30 a.m.
Youd's wife as well as a boy were inside the house at the time of the crash. They were lucky they escaped and the plane did not hit other buildings or any power lines, police said, ABC News reports. Youd's biological children were not in the home at the time of the crash. Before stealing the plane, Youd called his biological children who were staying in the home where he later crashed and told them to "go stay at their mother's house" that night, which they did, police said. Investigators believe the plane belonged to Youd's employer and that he intentionally flew into his own house. He was an experienced pilot.